LOS ANGELES, CA (June 11, 2014) Following a tragic motorcycle accident, Mike Bauer found himself confined to a wheelchair, a paraplegic. Used to constant movement and reinvention, Bauer was living in chronic pain when he became a patient of rehabilitative neurosurgeon Dr. Scott Falci. When Falci recognized the signs of depression in his patient and after learning about Bauer's earlier life, which included driving race cars, the doctor conceived of a race car with adaptive controls. Driven: From Wheelchair To Race Car, shares the collaboration of Mike Bauer and Dr. Falci as they develop new technologies to put paraplegic and quadriplegic folks back on the track. Directed by Brian Malone (PATRIOCRACY, CELEBRITY TRIALS IN THE MEDIA), the documentary will be released by Cinema Libre Studio on DVD starting June 24th with on demand options to follow in July. Falci Adaptive Motorsports, founded by Dr. Scott Falci, is one of the world's premiere organizations dedicated to putting wheelchair-bound race enthusiasts into a racing experience. The ultimate mission of Falci Adaptive Motorsports is to add "motorsports" to the ever-growing list of athletic and recreational pursuits enjoyed by the spinal-cord-injured population while advancing the development of adaptive technologies. The car built for Mike Bauer is a 2001 Corvette C5 Stingray with the design team RaceKraft and Design and is equipped with hand controls for acceleration, an infrared shifter, and a hand brake. Says by Brian Malone, Emmy winning director of PATRIOCRACY and CELEBRITY TRIALS IN THE MEDIA, DRIVEN takes a look at a family whose life was shattered in one tragic moment as they push to give Mike Bauer's life a new purpose. SYNOPSIS: Mike Bauer was born to be fast until a tragic motorcycle accident left him paralyzed and on the verge of suicide. 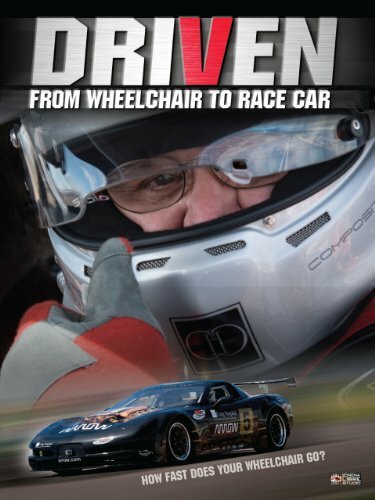 When he meets Dr. Scott Falci, a rehabilitative neurosurgeon and an amateur racer, they venture into the uncharted territory of designing a race car for the paraplegic driver. Will climbing behind the wheel of this new race car be enough to bring Mike back from the brink?